A book that truly celebrates and encourages a love of reading – this book should be in every library. 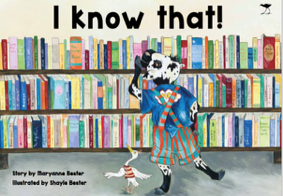 Bester sisters have a new addition to the “Cool Nguni” children’s book series. 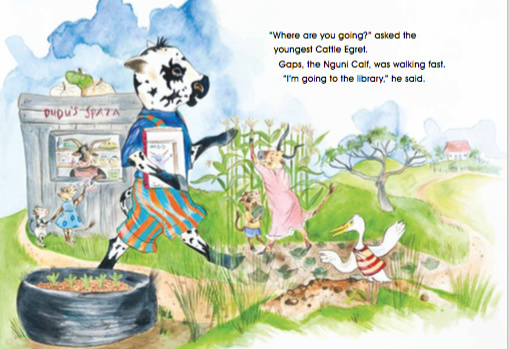 Gaps the Cool Nguni takes his “know-it all” companion, the cattle Egret, on a gentle journey of discovery. The mysteries of the library are revealed in a fun and engaging way. I Know That! is filled with humour and silliness highlighted by the unique illustrations by Shayle Bester. The cattle Egret tries to show everyone just how smart he is when really there is still so much to learn. In truth, he is so clueless that the young readers get to be the experts. The excursion through the library helps young readers engage in the world of books and reading. They also learn from little Egret that there is more to learning than just shouting, “I know”.